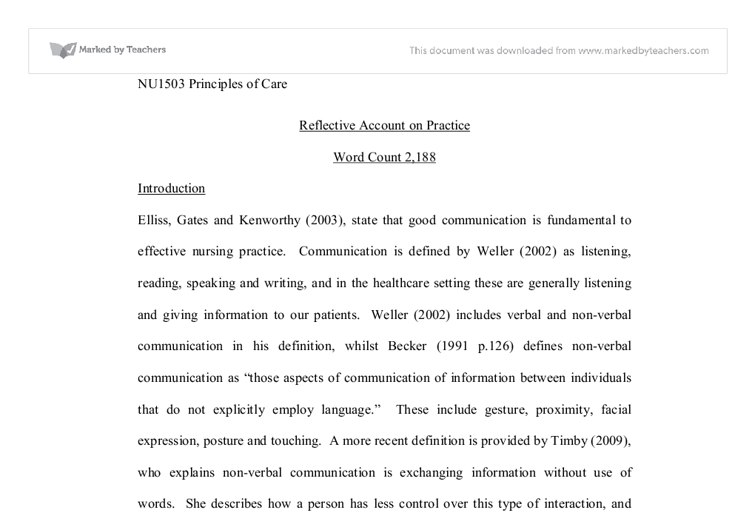 Reflective Account on Practice Word Count 2,188 Introduction Elliss, Gates and Kenworthy (2003), state that good communication is fundamental to effective nursing practice. Communication is defined by Weller (2002) as listening, reading, speaking and writing, and in the healthcare setting these are generally listening and giving information to our patients. 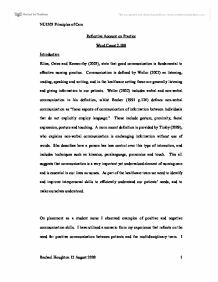 Weller (2002) includes verbal and non-verbal communication in his definition, whilst Becker (1991 p.126) defines non-verbal communication as "those aspects of communication of information between individuals that do not explicitly employ language." These include gesture, proximity, facial expression, posture and touching. A more recent definition is provided by Timby (2009), who explains non-verbal communication is exchanging information without use of words. She describes how a person has less control over this type of interaction, and includes techniques such as kinesics, paralanguage, proxemics and touch. This all suggests that communication is a very important yet undervalued element of nursing care and is essential in our lives as nurses. As part of the healthcare team we need to identify and improve interpersonal skills to efficiently understand our patients' needs, and to make ourselves understood. On placement as a student nurse I observed examples of positive and negative communication skills. I have utilized a scenario from my experience that reflects on the need for positive communication between patients and the multidisciplinary team. ...read more. The NMC Code (2008) clearly states many standards of conduct which a registered nurse should be trusted to do, these including "You must treat people kindly and considerately" and "You must listen to the people in your care and respond to their concerns and preferences". If as nurses we should comply with The Code (2008), a lot of work is required to raise the awareness of the importance of communication in the delivery of care. In 2007 the NMC introduced Essential Skills Clusters. These Essential Skills are to be delivered by all registered nurses', one of these clusters containing Care, Compassion and Communication. The NMC introducing these clusters show the importance of interpersonal skills in nursing care, and significance of communication in the nursing profession. On this occasion, the nursing team did not show care or compassion for Betty, and certainly did not engage in therapeutic conversation. As a student nurse I felt I had the knowledge and skills to approach the patient to appropriately calm and reassure her. Heyward and Ramsdale (2008) explain that a patient who thinks his nurse is not listening to them will lose faith in the service a nurse provides, and in the nurses' willingness and ability to do as they have promised. ...read more. Additionally time and commitment to our patients is priceless as it can never be taken away from them. We also need to realize that ones own values have effects on interaction with our patients, so appreciating that our client has different values and beliefs to ourselves help us gain insight into the reasons they think and behave as they do. Some consider interacting with others as hard work, but we as nurses need to understand that communication is the gateway to successfully helping our patients and improving our skills. Action Plan On reflection I saw first-hand how easily communication can break down, if not between nurse and patient, then within the multi-disciplinary team. I will take the experience with me throughout my nursing education, remembering the importance of effective communication, and also the ability to look back at an experience and break it down to discover what really happened. Taylor (2000) defines how reflection on action occurs perfectly. He explains that only when details of events are recalled and analyzed, unpicked and reconstructed considering all aspects of a situation, can one gain fresh insights and amend actions. He quotes "Critical thinking is essential for safe practice". (Taylor, 2000 p.64) This should be an ongoing and extensive process for all nurses in practice. I will be more aware of my interaction with others and will constantly reflect on my experiences to see the whole package of care delivery. ...read more. This student written piece of work is one of many that can be found in our University Degree Nursing section. Making sure best interest decisions are not taken likely and have been given full thought before following through with any decision. Principles and theories are there to help back up decisions, making sure the right conclusion can be made and understanding how a decision was made. I will use this reflective practice throughout my training and then into my professional life as a registered nurse and will look into why I did a particular task, how I and others performed and most importantly the view from the clients perspective and how it will develop my nursing skills moving forward. and her assistant * N- time consuming and costly Organization workshop for Rogers and her assistant * P- will help improve their leadership skills * P- will improve organization * P- will help floor when under pressure * N- time consuming and costly Criteria for how feasible solutions are: 1.
by washing our hands and then placed on protective clothing, which was a disposable plastic white apron. Hand washing is well researched and controversial having been found to be the single most important procedure for preventing nosocomial infection as hands have been shown to be an important route of transmission of infection (Department of Health 2001). Reflect on an incident that took place whilst I was on my practice placement. It happened in a split second, a second which felt like I was watching a scene frozen in time. I remember the worker telling Carol to give her a kiss, the words that she said did not register, until I saw the action, mainly because it was not the expected performance of a professional, by any means. In fact the ability to communicate well is regarded as a key element in the essence of care (DOH, 2003). including shared decision making, some doctors describe it as having their directions followed and their needs anticipated (Barnsteiner et al., 2007). The nursing and midwifery code of conduct (2008) state that nurses should work co-operatively with others while respecting their knowledge, experience and contribution (Nursing and Midwifery Code of Conduct, 2008).